Quick And Easy Chalk Talk Card Gift Set! I find it useful to have quick gifts ready to go for whenever I may need them. It’s easy to make a set of 5 or 6 cards, tuck some envelopes in with them and package them in a pretty way. Everyone needs cards to give for all occasions! Stampin’ Up!s Chalk Talk stamp set and framelit bundle make very quick work of creating a card set! Having a set of In Colors that work together makes a huge difference too! You can imagine the embellishments that you could add to these cards to dress them up as well. Some rhinestones and ribbons would take them to the WOW! level! 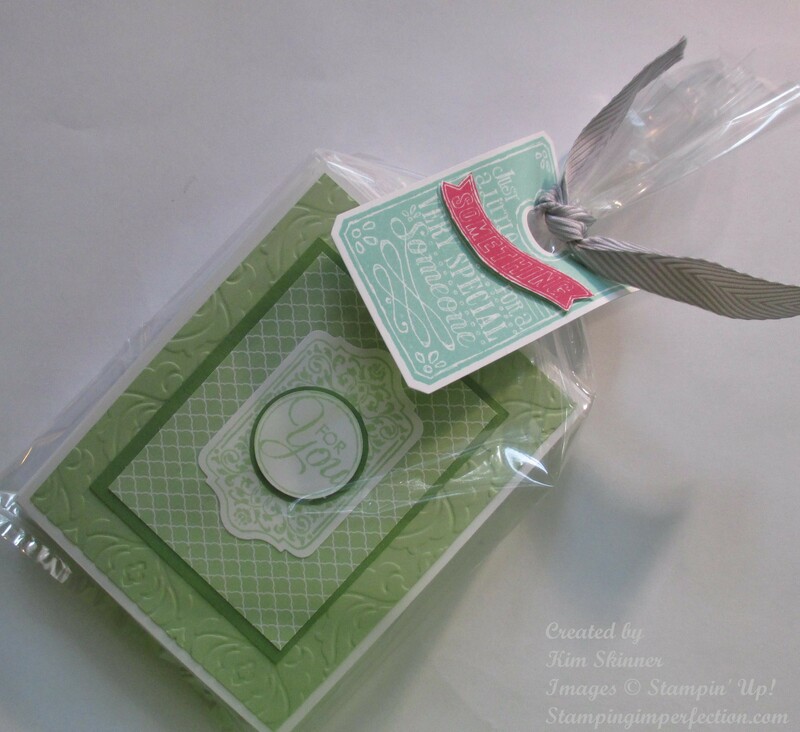 Package your cards with Stampin’ Up! Envelopes and some of the new Chevron Ribbon along with a Chalk Talk Tag and you’ve got a great looking gift for someone! Don’t you love making quick, easy, yet fabulous cards? 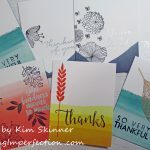 Of course you want to create cards that will make someone say, “Wow! You made this?”! You are too busy to search for ideas and figure out the measurements and supplies that you’ll need to make the card? You spend too much time pinning great ideas and not enough time actually making them? You aren’t feeling inspired and need a boost of creativity delivered right to you so you don’t have to look for it! You are buying all of the supplies and not using them, leaving you feeling guilty about spending the money!! 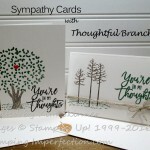 Simply Cards was created just for you!!!! It is a series of card tutorials delivered twice a month directly to your inbox! Every 15 days, you get two card ideas, pictures, measurements and instructions to complete them. 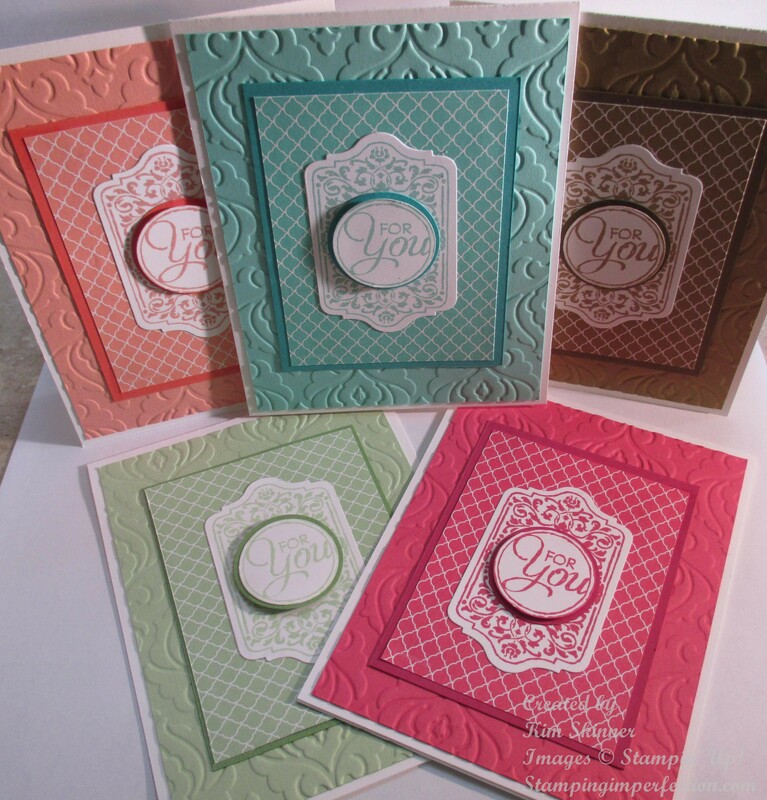 That’s 4 exclusive card ideas using current Stampin’ Up! products each month for only $4.95 a month!!! Did you say 4 exclusive quick, easy, yet fabulous card ideas with instructions for only $4.95 a month? Yes! No more searching for ideas or figuring out the measurements, get them delivered every 15 days! Get inspiration delivered right to your inbox without wasting time searching for it! 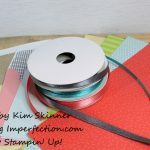 Get ideas and instructions on how to use the stamping stuff you are buying! 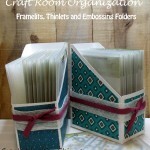 Stop feeling guilty about not using your supplies because the emails come every 15 days. That gives you time to sit down and make your cards before the next pair of card tutorials arrives! Kim those are beautiful! I too make card sets for gifts. This year, so far, I’ve made a card set for each lady’s birthday in our office. Thank you! Wow!! That is ambitious! I love giving the sets too. It’s quick, easy and it feels good to give something that I’ve made! Hi Kim, thank you for such a WOW gift idea! I adore the gift packaging, unique!